My wife and I are visiting our nieces in NC and booked an accessible room at the Renaissance Asheville. Unfortunately, the room is not ADA-compliant and has problems beyond accessibility. Firstly and most importantly, the bathroom is not ADA-compliant. 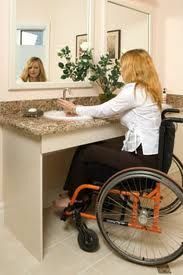 There is insufficient clear turning space for a wheelchair and no room for a wheelchair to pull up next to the toilet for a transfer (see picture below). I had a very hard time using this bathroom. I called the front desk but there was no other room available. Second, the aisle between the beds is too narrow for a wheelchair (see picture below). There was also furniture blocking the path to the window and the access to the second bed (I called and had this furniture removed, making the room somewhat ADA-compliant). Finally, the parking situation is abominable. The disabled spots are the closest parking spaces to the front entrance, but there is a very steep driveway that one has to climb to get to the front entrance. There is no accessible pathway marked from the parking spaces and no accessible sidewalk (I had to wheel up the driveway between cars, making sure I didn’t get run over). How is this allowed in this day and age? Oh, wait…it isn’t. The individual that signs off on these properties as being ADA-compliant needs remedial training in the ADAAG. As for non-ADA related problems, the TV in the room does not allow you to plug in any HDMI devices. The website advertises a “Plug-In High Tech room” but this was anything but. The standard Marriott jacks were on the desk, but none of them worked. When I called the front desk about it, they said they know they don’t work and they had no jack pack they could offer because the TVs were so old that they were not compatible. So, I resigned myself to watching TV. ABC, ESPN, and ESPN2 were showing no signal or a scrambled signal. Called the front desk again and they sent maintenance up who jiggled a few wires and it started working properly. Next morning, they were out again (as were about 5 other HD channels). I didn’t bother complaining about it as I was getting dressed to leave. And I won’t even mention the fact that there are only about 10 HD channels and the rest are in SD (most of which are broadcast in HD) and have poor picture quality, even for SD. Is it that hard to have a mostly-HD lineup, especially in a Renaissance property? Today, we left the room around 11:30 AM and housekeeping was down the hall. It wasn’t that late so I didn’t see the need to tell housekeeping that I needed the room made up. Well, we got back to the room around 5:30 and the room had not been touched. I did not have a DND sign on the door (which was the front desk’s first excuse) and was never called (usually there is a message if the DND sign is on as housekeeping would call and ask if I needed service or towels). Oh, and regarding the towels, they are very hard and thin and nowhere near the plush towels they used to be. Renaissance properties are supposed to be part of the “Distinctive Premium” line of hotels, but the last few stays at Renaissance properties have fallen far short of this standard. The hotels are old and in dire need of being refreshed. For that matter, I can say the same thing about my last few Ritz-Carlton stays as well. I don’t mind an old hotel, but there shouldn’t be water spots on the bathroom ceilings, chipped tiles, old furnishings, outdated electronics, and, most importantly, non-ADA-compliant rooms being sold as ADA-compliant. I am getting more and more frustrated with Marriott properties that I may just ignore my Gold Elite status and stay elsewhere (or maybe Sheraton properties have a better track record – with the merger, now I can try them). I hope they clean up their act soon as this is getting very tiresome and something I don’t need to deal with whenever I travel. I am traveling on business to Milwaukee and decided to fly into Chicago and drive to Milwaukee. I rented a car from Hertz. As Hertz no longer offers hand controls in minivans, I rented a large SUV. My confirmation shows a large SUV being rented. I requested hand controls left (HCL) and called Special Services to have the spinner knob added. The rep put me on hold and came back and told me that he confirmed with the location manager that the HCL and spinner knob would be added. This was on Sept. 8. For the past few days, I have been trying to call the location to directly confirm the HCL and knob but nobody ever answers or returns the numerous messages I left. Today, I arrived at ORD and took the bus to the rental location. As usual, my name was nowhere to be found on the Gold board (not sure why I even bother using it). I go and wait on line (the avoidance of which is the reason to use Gold) and the rep looks for my car, finds it, and asks her associate to confirm the spinner knob. While waiting, the text telling me where my car is (which should have been sent while I was in the air) finally arrives, but that’s another issue. The associate returns and indicates that there is no knob. The manager eventually comes over, says he has to find a mechanic to install the knob, and that I have to wait. 40 minutes later, I go over to the car to see what the delay is since installing the knob should take 10 minutes. I look in the vehicle and see that there are no hand controls! I ask where the hand controls are and get a blank stare from the manager. I ask him how he expects me to drive the vehicle (I am a bilateral amputee in a wheelchair). Same blank stare. I ask him to find out where the vehicle I need is located. An hour later, they cannot find the vehicle and have no options for me. On top of all this, my SUV was changed to a minivan without telling me and, as we all know, Hertz no longer installs hand controls in minivans (why, I have no idea). I prefer minivans, so that wasn’t very disturbing, but the fact that they changed it without notifying me is very problematic and may be the cause of this entire debacle. Luckily, I am with a colleague who said he would drive today but he is leaving tomorrow and I have to drive to Milwaukee tomorrow night for a business meeting early Monday and have no idea how I am going to get there. 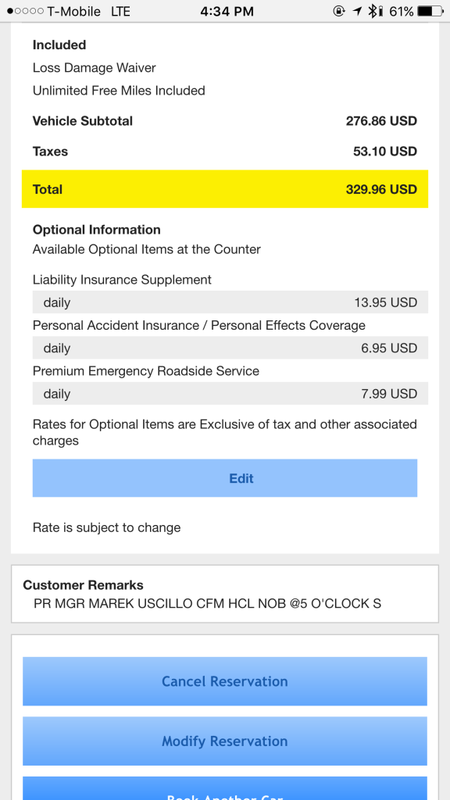 Hertz is trying to find a vehicle for me and will call me if and when they find one. I’m not holding my breath and plan on having a car service drive me and I will bill Hertz. This is completely and totally unacceptable. The manager confirmed the hand controls as shown on the reservation below. Notice anything wrong with this picture? What sadist designed this ADA bathroom? Who puts faucet handles in front of a sink? While this design may be artsy and comfortable for able-bodied people, wheelchair users have special needs and this sink fails on all fronts. I don’t know exactly what ADAAG requires, but this can’t possibly be compliant. I checked with the front desk and all of the bathrooms are like this. No excuses about this being an old hotel since the sinks are apparently part of a “refresh” and look pretty new (as opposed to the shower which has cracked tiles and ancient controls which feel like they are going to fall out of the wall if you touch them too hard (and for the record, they also appear to be non-ADA compliant, though I cannot speak to what ADAAG requires for shower controls)). 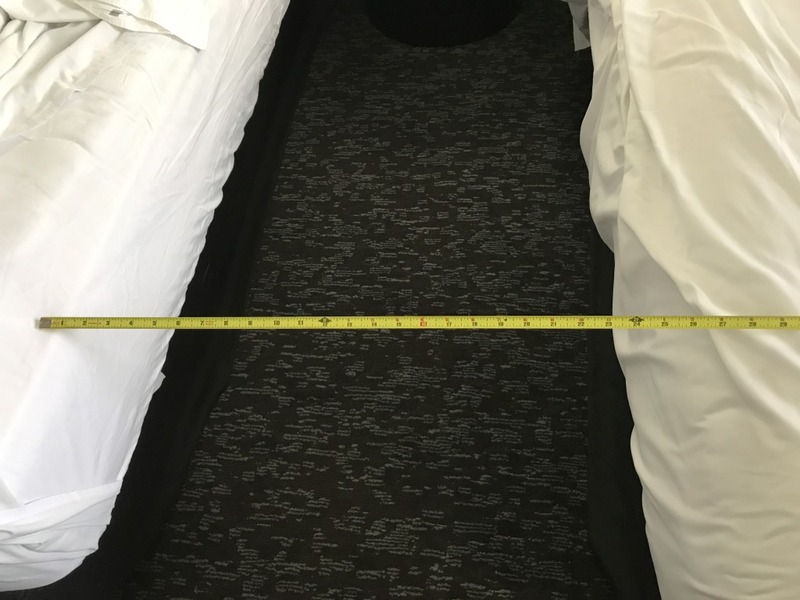 This is yet another entry in a long line of ADA violations for Marriott (see my earlier posts here, here, and here). They need to do something about this or they are going to lose me as a customer for good. Their ADA consultant needs to be fired and replaced with someone competent because this is just unacceptable. After the debacle at a Renaissance in Pittsburgh (click here for details), I decided to email ahead of arrival to see what I was in for. I asked to confirm that the room was wheelchair accessible and this was the response I received: “The bath is half accessible which means it has grab rails in the shower tub combination. The shower is not a roll in shower however. 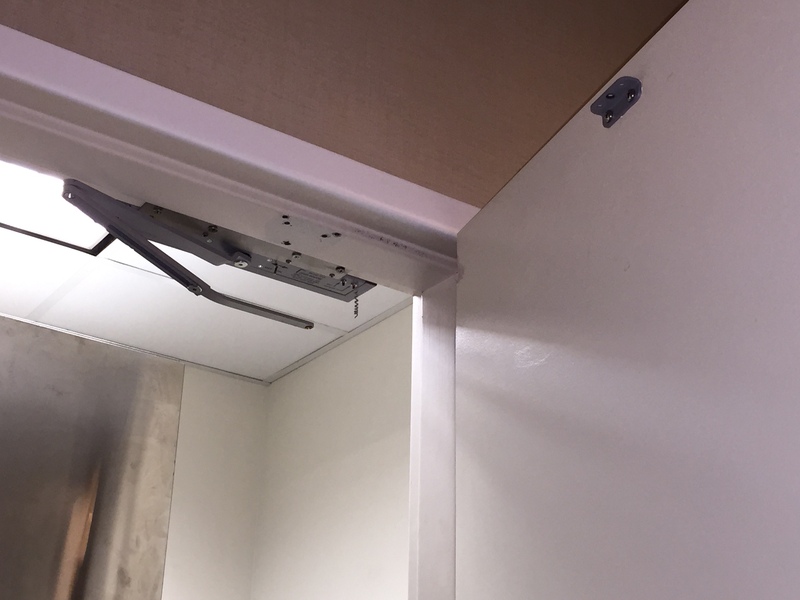 ” Ummm…grab rails do not make for an ADA bathroom. So much for an accurate website reservation. I was OK with this as I can use a tub or roll-in shower and actually prefer a tub, so I figured I should be fine. Well, the reality of things was a bit different. 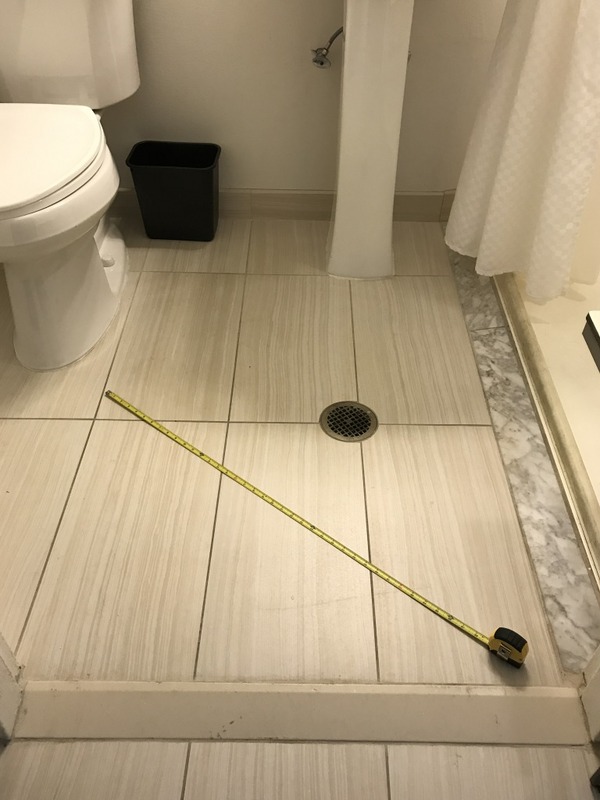 The only accessible feature in the room is the non-master BR bathroom which is a proper accessible bathroom despite the email response, albeit with a few issues (more on this later). The rest of the suite, however is not accessible. The door is barely wide enough for me to get through (I have a wheelchair with a 29″ track) and does not have a lowered peephole. The master BR is not accessible at all. The desk is in a corner and a wheelchair cannot access the desk. Very narrow path around the bed as well. 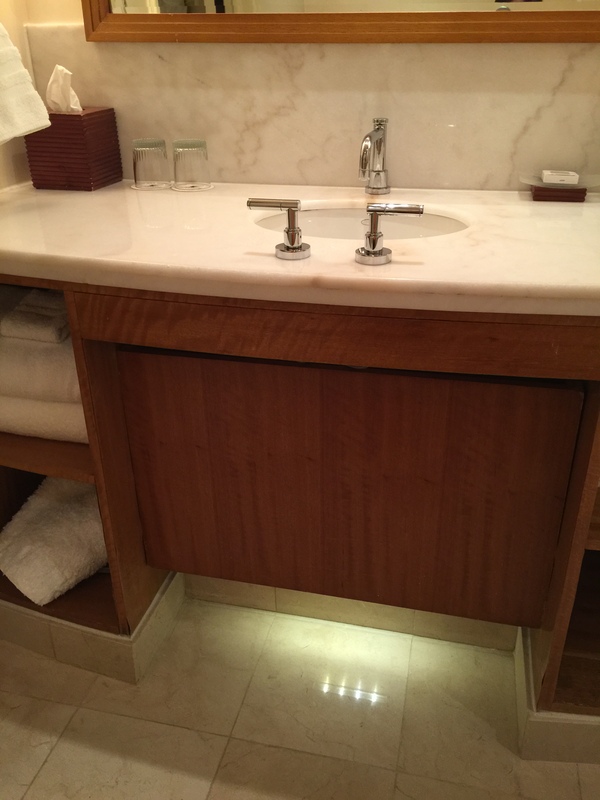 And the bathroom in the master BR is a standard non-ADA bathroom. So, I was relegated to the outside bathroom and to using the table in the living room area as a desk. As for the bathroom, people in wheelchairs can’t reach up to get the shampoo and conditioner you leave on the only rack in the shower, and leaving the handheld shower at its highest setting doesn’t make things easy for a disabled customer – yes, we can ask someone to help and I’m sure the staff would be happy to assist, but that is an imposition and puts us in the uncomfortable position of having to ask for help all the time. The valet area of the hotel is also very poorly designed. There is a curb the entire length of the driveway with no curb cut. For a wheelchair to enter the hotel, you have to go down the driveway where the cars go (very dangerous) and then come back up the hill on the sidewalk so you can enter the building. Not only is this difficult and dangerous (putting wheelchair users in the middle of automotive traffic), but it also requires you to leave the covered area and be exposed to the weather. This is a simple fix that should have been done years ago. I don’t know what has happened to the Marriott family of hotels. 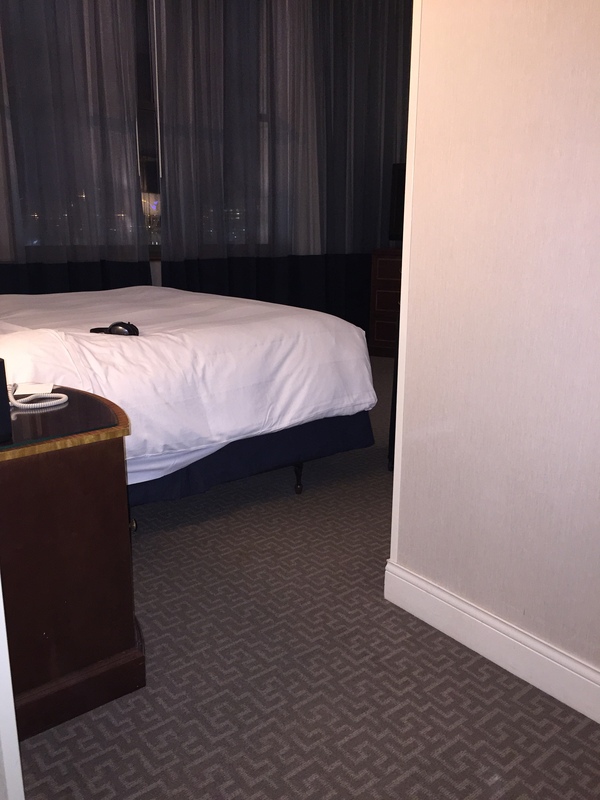 I became a Marriott loyalist because they were the first hotel to allow me to reserve and guarantee an accessible room online, but now everyone does that so my reason for staying at Marriott properties has been eliminated. My past few stays at Marriott brand hotels have been underwhelming to say the least. Marriott needs to hire an new ADA coordinator and review every property and their reservation system. I shouldn’t have to confirm every detail of a reservation – if the system says a room is accessible with a roll-in shower, the room should be. 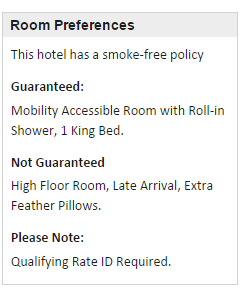 If I am guaranteed a king accessible room, the system shouldn’t try and upgrade me out of an accessible room. We are way past the era of blaming the computer system – Marriott is a sophisticated company and their systems should be state of the art. I’m very disappointed in Marriott and hope this trend is reversed as I have been generally pleased over the years but lately it has been a different story. And on a non-ADA note, the electronics on these properties need to be updated. The TVs are ancient, the HDMI jacks rarely work for plugging your computer in, and there are only a handful of HD channels – the rest are modulated SD channels and they look horrible. The guest services menu on the TVs take forever and frequently don’t work. The wifi in these hotels also needs to be updated – very slow, even if you pay for the premium package. And before you say that’s because there are many users, I have tried in the middle of the night and received the same slow speeds. Free wifi isn’t really a benefit if it is too slow to use. And paying for really poor wifi is just a slap in the face. 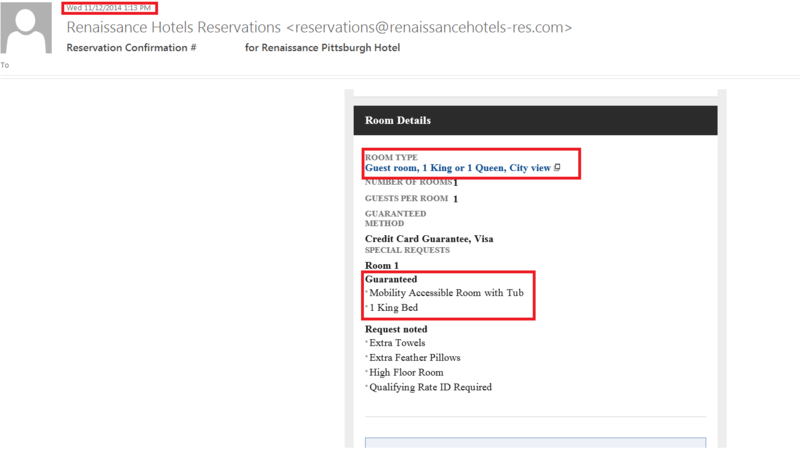 Following up on my prior post on the Renaissance Pittsburgh, I checked in yesterday expecting a disaster. It was even worse than I imagined. Who designed these rooms? Have they even read the ADAAG? How do they expect a wheelchair user to enter these rooms? 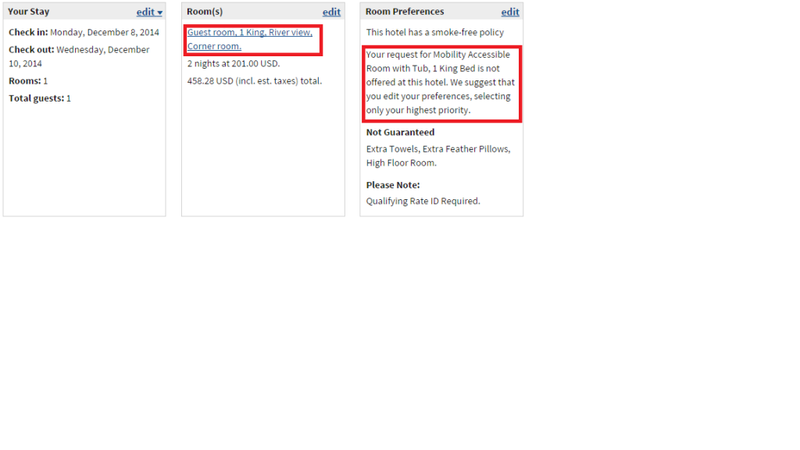 Totally and completely unacceptable for a hotel of this caliber (for any hotel, really). I go back down to the front desk and explain that neither room is acceptable. The rep shrugs and says that all of the accessible rooms are the same. 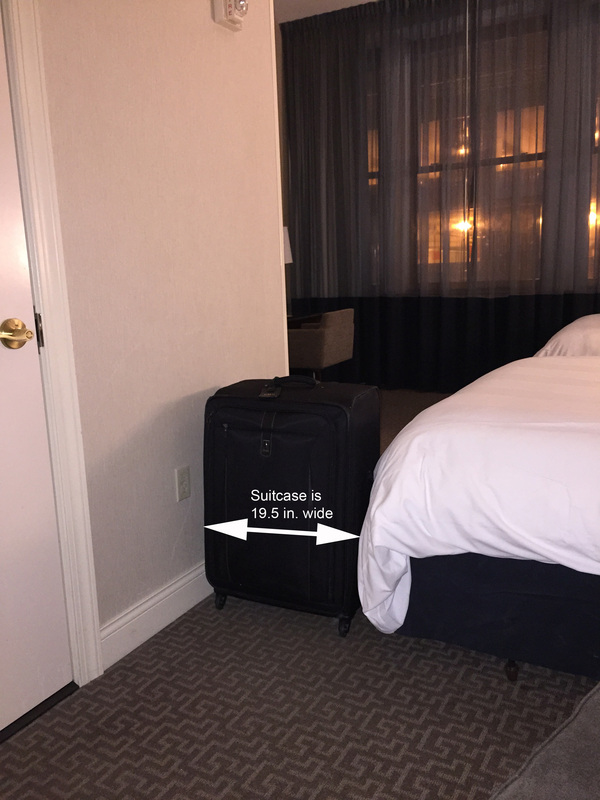 I ask if the bellman can help me move some furniture to allow me to enter the room. The rep agrees and the bellman and I head back up to the first room. He moves one of the nightstands and pushes the bed over to allow me to get into the room. OK – great. Now I can get into the room. Quite an ordeal for anyone to go through to simply get into a hotel room. WHAT????? How did this happen? I called Marriott and they said I was “upgraded” to an executive level room with a river view but that there are no accessible rooms that meet my requirements on that level. OK….so why did you move me? Did you really think that I would prefer a nicer view and a non-accessible room? 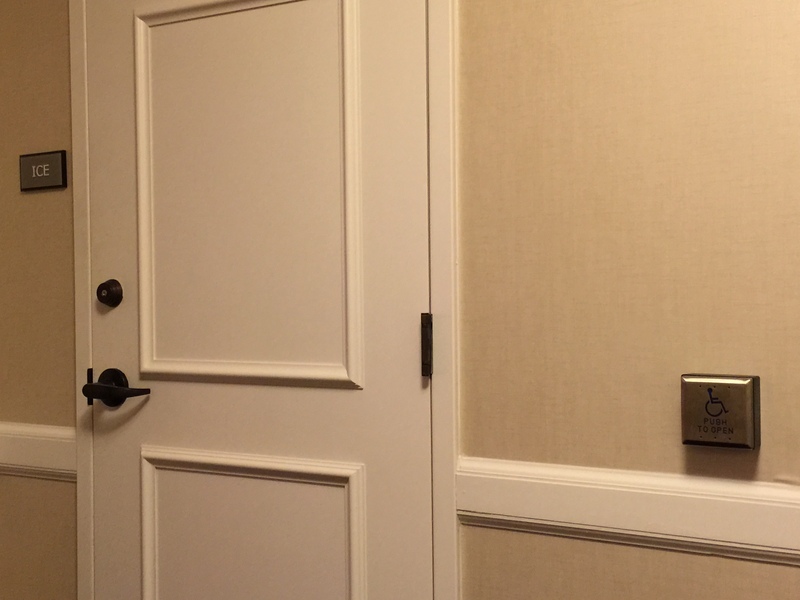 I appreciate the gesture, but how is it possible that Marriott has a reservation system that would move someone out of an accessible room into a non-accessible room? The first rep was at a loss to figure this out and transferred me to the “special services” line. They called the hotel and told me that the reservation was “fixed” and that I now had a KAT despite what the website said. Not being the trusting type, I called the hotel directly. They said the room was accessible but had a roll-in shower. So the rep at the hotel transferred me to their local reservation person who said that they only had two KAT rooms and that because a room number was not assigned to me when I made the reservation (is it ever? ), I was not put in one. Ummm…..sure…..OK….but then why does my confirmation email say that a KAT is guaranteed? While all this was going on, I made another reservation for the same night for the exact same room and received an email confirming that my request for a KAT was guaranteed. I went back and forth with the reservation desk at the hotel trying to find out why I was upgraded and why my email told me my room was guaranteed when it in fact was not. She could not answer that question and said her manager would look into it. Ultimately, she confirmed that I was in a KAT and apologized that it was on the third floor. What would have happened if I had not checked online to see that my reservation was still in good shape? How can Marriott allow this to happen? 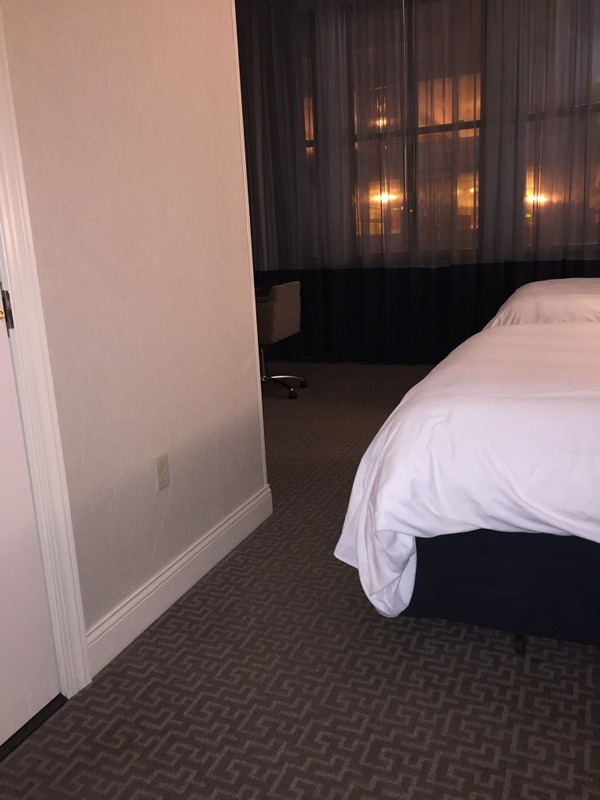 I stay almost exclusively at Marriotts due to the consistency of their accessible rooms and that I don’t have to call to make or change a reservation. This is very scary because this isn’t just not getting the bed you prefer – an accessible room is a necessity for me. 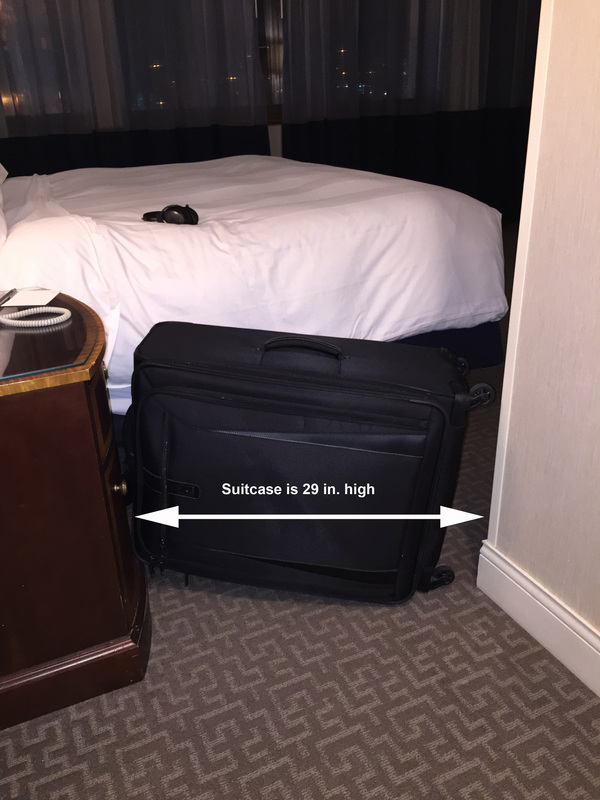 I look forward to seeing how Marriott handles this matter. Stay tuned. 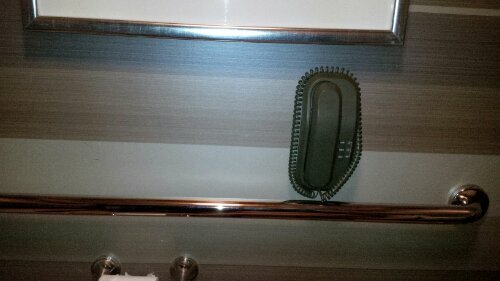 Ummmm…..how are you supposed to grab the grab bar?